Eat. Live. Laugh. and sometimes shop! : Party animals. I'm married to a rich man. New Orleans in 36 hours. Having just one kid is easy. Live. Eat. Shop. Children. Laugh. Travel. Christmas. Holidays. Mothers. Art. Books. Friends. Love. Music. Soup. Halloween. Health. Parenting. Dogs. Family. Quotes. Birthday. Blogging. DIY. Thanksgiving. Devotional. Giveaway. Social media. Twins. Camp. God. Marriage. Aging. Gifts. Green Living. Parties. Photography. Read. Summer. Wisdom. Beauty. Chocolate. Daughters. Forties. Hubs. School. Technology. Traditions. Weddings. Bloggy Boot Camp. Charity. Diet. Exercise. Forty. Hair. Happiness. High School. Internet. Movie review. Shoes. Stationary. Twitter. iPad Advent. Amazing. App. Apple. Awards. Blog boycott. Boys. Cleaning. Dance. Drink. Forgiveness. Google. Guest Post. Hubby. Internet Ads. Internet Safety. Magazine. Media. Movies. Names. Prayer Royals. Simple Pleasures. Ok these make me smile. And quite frankly, I laughed. Out loud. I think it's embarrassing for people over forty to LOL. Though I'm not officially "over" forty. Which is all besides the point. Oh, did you expect a point?! I'm not sure there is a point. 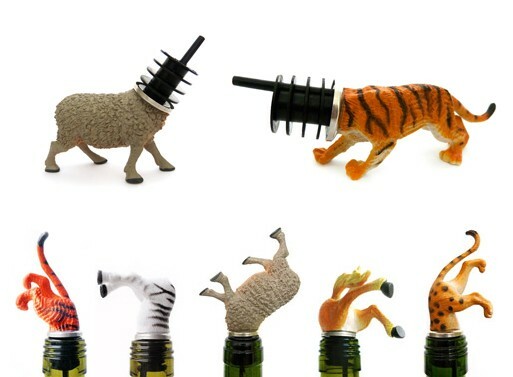 I simply wanted to share these delightful little animal wine stoppers. Eat. Live. Laugh. and sometimes shop!